The English Riviera Visitor Information Centre is situated on Torquay Harbourside and is open all year. The centre is managed by the ERBID Company and handles over 100,000 enquiries per year through face to face counter visits, email, telephone and Social Media enquiries. The English Riviera Visitor Information Centre is managed by Katrine Harrington and a small team of seasonal staff and volunteers. Telephone 01803 211211. Visitor services include What’s On, Car Parking Passes, Theatre Tickets, National Express Tickets, Bus Tickets and Timetables, Boat Tickets and the promotion of local Events and Festivals via the English Riviera What’s On Calendar. 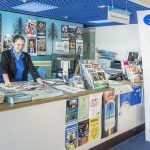 The English Riviera Visitor Information Centre is supported by a small number of carefully selected voluntary Visitor Information Points across the resort.